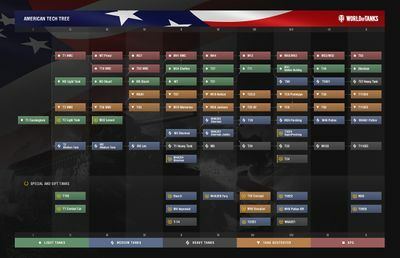 American light tanks tanks tend to be more adaptable in combat situations than other lights, and at higher tiers can fulfill the roles of scout and flanker very well. Their most notable feature is their good view ranges, top speeds (in the Chaffee line), and high rate of fire (which can help in a brawl). American lights are relatively large targets and can lack in armour. The line splits into two at tier 5, after the M5 Stuart and recombines at tier 7 with the T71. Diese Seite wurde zuletzt am 6. Juni 2017 um 14:39 Uhr geändert.